There was a moment during my live painting at the Gordie Howe C.A.R.E.S. 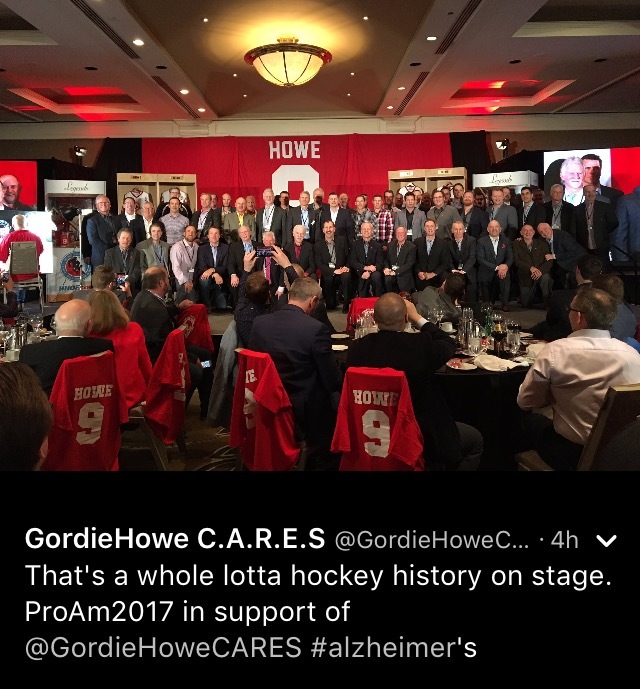 (Center for Alzheimer's Research and Education Society) Pro-Am Hockey Tournament luncheon that I thought to myself; How did I get here? That question was probably joined by What the hell am I doing here? I wasn't panicking on the outside, but on the inside I was absolutely questioning whether or not I was going to be able to pull it off. You see, the plan was that I would arrive at the venue and start painting at about 9:30 am. That would give me an hour and a half lead time before the crowd of almost 600 started to stream in. The problem was that the breakfast symposium that was happening in the same space went long. It was around 10:30 am before I was able to put paint to canvas. In my mind, I had planned for about four hours of painting before they would auction it off to raise money for the Gordie Howe C.A.R.E.S. organization. Even though it would be tight, I felt confident that I could get the piece close to completion in that time. Having lost an hour, I was seriously questioning my abilities. Trust the process, I thought to myself; trust the room. And I did. By the time the conversation with Mark and Marty Howe and the hot stove were done, I was able to rough in the faces and much of the jerseys. In that large space, in that lighting, and on the big screen, the painting translated quite well. In other words, it is several hours from completion, but it was at a point where the audience was ready, willing and able to bid on it. Mark and Marty both signed the painting, which certainly help enhance its one-of-a-kind quality. I can't remember the name of the NHL alum they brought up to do the auctioneering, but he did a great job getting the bid up to $10,000. At one point, Mark Howe himself put in a bid of several thousand dollars. 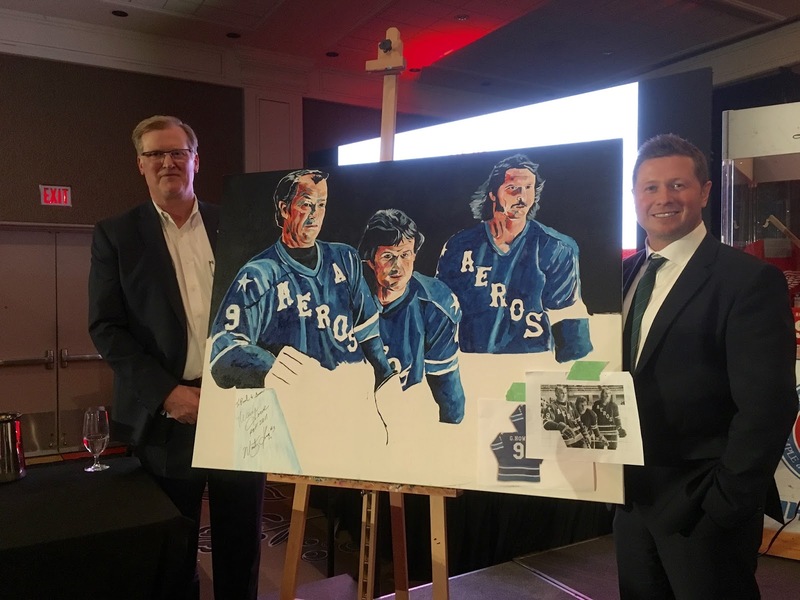 The purchaser was a guy named Paul Myers (on the left in the above photo) who, as I found out later, was down in Houston at the time that Gordie, Mark and Marty played for the Aeros. It was around the same time that he met and fell in love with his wife Susan. There was also a Gordie Howe connection to their meeting. So, for Paul, buying the painting was deeply personal. While this live painting experience was among the toughest that I have done, it was one of the most rewarding. I was able to sit on stage painting away while Mark and Marty reflected on their personal journeys and the final years of their mom and dad. "It's always hard to lose someone when they die," said Mark. "It much harder to lose someone while they are still alive." He nailed it. The work of organizations that focus on dementia, Alzheimer's and other mental disorders is so important. I was honoured to be a small part of this event and the purpose behind it.